For the best experience at Office.com, sign in with your Microsoft account, or the work or school account you use with Office. Microsoft account This is the email address you use to sign in to Microsoft services like Outlook.com or even Xbox Live. It’s called your Microsoft account, but it doesn’t need to be a Microsoft email address; it’s whatever email address you want to use—the same way you sign in to any number of services on the web, like Facebook or Twitter. Work or school account This is the account you were assigned by someone at your organization and it's what you use to sign in and access the Office 365 services in your organization. After signing in, store any documents, spreadsheets, presentations, and notebooks you create in the Office Online programs in your OneDrive library. You can then share your Office files via a link and work on them with other people in real-time. This collaboration feature allows you to work together at the same time and see each other’s changes immediately. 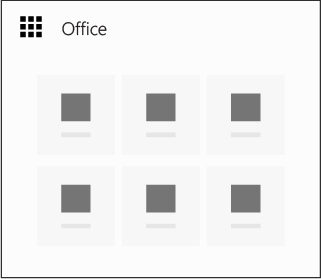 Think of the Office.com home page as your start screen for online productivity. At templates.office.com you'll find lots of free templates so you don’t need to start from scratch every time you create a flyer, calendar, budget, invoice, school project, photo album, or many other kinds of documents. Office Online runs in your web browser so there’s nothing to download or install, but if you have a desktop license for Office, you can also open and continue working on online documents saved to your OneDrive using the Office apps installed on your computer. Learn more at OneDrive video training. Office Online is great for working online and from anywhere, but you can also move seamlessly to the full-featured desktop apps--without leaving your document. Check out the Design and edit articles, or the Do your work article in the Online Quick Start guides for more details about moving between the online apps and the desktop apps.